After releasing the infectious Caribbean/Hip Hop crossover single "Duele", indie rapper Dez Nado recently announced an upcoming televised tour that will hit multiple cities in the southeast U.S. throughout the fall of this year. The tour, which kicked off in mid-October at Suite Jacksonville with Atlantic Records’ K Michelle, will co-promote Dez’s new Universal Music Group-distributed album "LaDolceVita" and his cable reality TV series franchise "Life & Grind", which is currently airing on Bounce Network Jacksonville (Comcast 225/Digital 17-2) in the northeast Florida/southeast Georgia market and will premiere in the Atlanta market on DeKalb25 (Comcast 25 – Atlanta metro) in early 2017. The newly popular TV series "Life & Grind" first aired in August 2014 and has been steadily gaining support and popularity in and around Dez Nado’s hometown of Jacksonville. It innovatively provides viewers with a first-hand look into the lives and daily grinds of a cast of 8 rappers, singers, and entertainment entrepreneurs who are trying to "make it big" in their city. Dez Nado seems to have found his niche, creatively combining business savvy with passionate artistry and collab’ing with his cast mates to create and capitalize on new avenues to reach and grow their fan bases. Some recent events featured on the show include dual album release parties for Dez’s LaDolceVita; the first at rapper Future’s former recording studio 11th Street Studios in Atlanta, GA, and the second at WinLab, the studio of T-Pain/Nappy Boy’s Young Cash and Cash Money Records’ T-Rone in Jacksonville, FL. Also featured was a Spring Break performance at Palace Nightclub in Atlanta, where Dez Nado opened up for Atlantic Records’ Young Dro and Memorial Day weekend at Bunker & Miami Live Studios (South Beach Miami, FL) where Dez performed at a G-Unit Records-backed showcase, earning a One-on-One with A&R Mario Gonzalez. The season finale included a Life & Grind-backed Spring Fest and Summer Fest concert in Jacksonville, two of the biggest indie events in north Florida that Dez and crew not only created and coordinated but also reached a level of local buzz that landed Dez on the local news, in regional newspapers/magazines, and on the radio. Dez credits his TV series for much of his recent success, saying "[The TV show] has opened doors for my music that my music never would have by itself". This has become evident in the buzz of his latest music releases, including his 2015 DigiWaxx Global "Futuristic" single, which saw more than 12,000 units distributed via online and physical outlets as of Summer 2016, and his early 2016 "American Dream" single that was heard in the UK on the famed AmazingRadio.com and on the west coast throughout the 2016 NBA Playoffs during all Portland Trailblazers home games. Some of the doors Dez referenced being opened probably include him being invited to the invite-only 2015 BMI Hip Hop/R&B Awards in Los Angeles after getting his first major BMI song credit with Atlantic Records’ Sevyn Streeter, winning 2014-2015 Jacksonville Artist of the Year award, receiving two Georgia Music Award nominations, and consecutive (2015 & 2016) BET Hip Hop Awards pre-show performances in Atlanta. 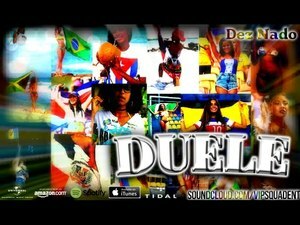 The new single, "Duele", has been called "arena music" by one of Atlanta’s premier industry publicists Lalaa Shepard. It’s a catchy, latin-influenced, upbeat, bachata/reggae fusion with anthemic, live instrumentation and vocals blended with a unique, hip hop vibe, all a reflection of Dez Nado’s mixed American, Jamaican, and Panamanian roots. Dez stated he plans to televise most of the footage from the upcoming tour, which will be called "Life & Grind: USA – Homecoming 2016". The tour will include stops at several college campuses including Howard University, Florida A&M, Bethune-Cookman, University of Central Florida (during Florida Classic weekend, one of the largest annual weekend events in the south, after Dez/Life & Grind appeared locally on MTV, BET, ESPN in Orlando on self-made commercials in promotion of his "Florida’s Finest" mixtape and its release party at VAIN nightclub with Ciroc & Belair vodka sponsors) and Spelman/Morehouse, during which he plans to visit various classrooms/classroom-like settings before or after performances to discuss societal issues, community empowerment and awareness, socio-political affairs, as well as the relevance of these factors to hip hop and Black culture. These tenets represent the meaning of his latest Universal Music Group-distributed album (iTunes, Spotify, Amazon, Pandora, TIDAL) "LaDolceVita", which was released in March 2016.